what is the capacity of 2x2 or 3x3 tube steel? 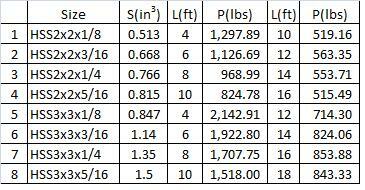 The tube steel capacity is calculated by using the formula S=M/Fy, where M is expressed point load format M=PL/4. P is the load in pounds applied at the middle of the tube steel and L in feet i.e. if L is 4 feet long then the load P is applied 2 feet from the support point, 3 ft from support for 6 ft long and so on. The capacity in this case is referred to the how heavy a load that the tube section can carry given a specific length. By substituting the PL/4 in the S equation above and solve for P yields P = S*Fy*4/L. The result of this equation is shown in the table below. S is the tube section modulus found in tube steel properties. Fy is 66 percent of the yield strength of structural tube which is 46 ksi or 46,000 psi. In the table there are two columns of length L with their respective load capacity P. This is to show the capacities of these tubes decrease as the length increase.